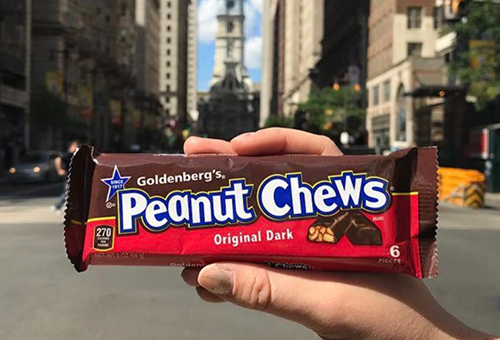 GOLDENBERG’S® PEANUT CHEWS® was first introduced by the Goldenberg family in 1917 and has been a local favorite to the Philadelphia area since its inception. The candy was first used as a ration for the U.S. Military during WWI making the high-energy, high-protein recipe and unique taste popular among the troops. The candy was then brought to consumers and has been around ever since, serving fans all over the Northeast region and in Florida. PIDC assisted GOLDENBERG’S® PEANUT CHEWS® with funds to purchase a new building and equipment when the brand changed facilities in 1998. Today, the delicious candy continues to be produced and distributed out of its hometown of Philadelphia, PA. In 2003, GOLDENBERG’S® PEANUT CHEWS® was acquired by Just Born, Inc., a third-generation family-owned candy company that is the maker of some of America’s most beloved and iconic brands including PEEPS®, MIKE AND IKE®, and HOT TAMALES®. Grab some GOLDENBERG’S® PEANUT CHEWS® today!